I can’t tell you how many hours of my life I’ve spent with headphones on my head. Whether you’re editing tracks in your apartment at three in the morning or recording vocal overdubs, headphones are an invaluable component of your home studio. That’s a fair question. The biggest single reason you need headphones is for recording. Since you only want your instrument or vocal to be recorded, you’ll obviously need to mute the studio monitors while recording. You need to be able to hear what’s being recorded as you record it, and that’s where headphones come in. I’ll do this a lot with quick song demos. I’ll set things up, then throw the headphones down and just play. It’s very musical for me, and it helps me focus on the performance rather than the sound in my headphones. When taking this “overdub” approach, you record one part first (guitar, for example), then you record additional parts on top of it (like a second guitar part, drums, vocals, etc.). To do this, you need a way to hear the parts you’ve already recorded while you record the additional parts. This is why you need headphones, since, as I mentioned before, you’ll be muting your monitors during the recording process. Which Headphones Should You Get? There are various types of headphones out there – open, semi-open, and closed. For recording, it’s best to go with a set of closed headphones. Closed headphones (particularly circumaural or “over-the-ear” headphones) are designed to keep the sound from leaking out of the headphone and getting picked up by the mic. I’ve had many a recording session where the guitarist plays the last chord of the song, and then as the music fades out you hear a tick…tick…tick… That’s the sound of the click track (or metronome) bleeding out of the headphones into the mic. While the Sony MDR-7506 headphones are probably the most popular, I still get too much bleed when I use them. I’ve fallen in love with the Sennheiser HD-280 Pro headphones. They both sell for around $100, but the HD280s completely surround the ear. In fact, they’re so good that when I’m wearing them I don’t hear my wife come into the studio. She’s scared me so many times that I had to make a rule that she’s supposed to flick the lights when she comes in, so I know she’s there. As I mentioned in the last article, headphones really aren’t ideal for mixing. However, they can be quite useful. I always check my mixes on headphones to make sure it sounds good to all the “headphone wearers” out there. I also use headphones quite a bit when I’m editing, as you can hear little details a bit better. As far as mixing goes, I know plenty of folks who do their mixes on headphones, but typically a good pair of studio monitors is going to give you a better chance at good, consistent mixes. 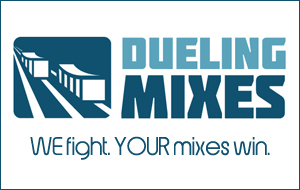 However, the biggest challenge you face when mixing is simply learning how to mix on whatever equipment you have. You need to learn how your equipment (either headphones or studio monitors) sounds. Then you must learn how to make that sound translate to the rest of the world.